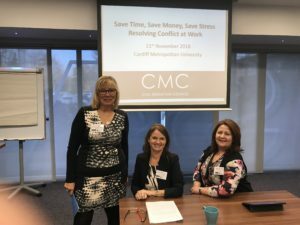 The CMC’s event series; Save Time, Save Money, Save Stress Resolving Conflict at Work has travelled across the UK and a few weeks ago came to Cardiff. Kindly sponsored by Cardiff Metropolitan University the event saw a great range of speakers and expert panellists covering a range of industry sectors. With speakers including the CIPD, ACAS, Lloyds Banking Group, Squire Patton Boggs as well as local organisations such as Rhondda Cynon Taff County Borough Council and Companies House, delegates were provided with a range of viewpoints around the benefits of using informal conflict resolution options as well as useful insights, tips and guidance about how to introduce such practices within their own organisations. Alison did a fantastic job of organising the event with the CMC Workplace and Employment Group Committee. We have been delighted with the positive feedback from delegates via social media and we wanted to take this opportunity to share some of the key themes and insights that came out of the day. Conflict will be present in every business and a key theme from all of the speakers was the importance of how that conflict is managed. Rachel Suff, senior policy advisor at the CIPD, provided some interesting statistics from an employee survey carried out by them amongst circa 2,000 UK employees, into the causes and impact of workplace conflict. The survey revealed that 4 in 10 employees (38%) reported experiencing some form of interpersonal conflict at work with the largest impact being stress (43%) and a drop in motivation (39%). It was evident that there is still a way to go in embedding informal conflict resolution options as a means of resolving conflict within organisations with a large percentage of employers resorting to formal disciplinary action (57%) or grievance procedure (34%) as a way of managing conflict. Paul Christer, Internal Mediator at Lloyds Banking Group shared the mediation journey that Lloyds embarked on in 2011. This started as a general HR case function and evolved to a specialist team working to resolve issues informally through a range of different methods including mediation, conflict coaching and Team Issue Resolution. Michelle Lindley, HR Advisor at Rhondda Cynon Taff County Borough Council explained how, the Council initially had one process in place for dealing with grievances, which was not positive for the organisation and there were a number of fractured relationships within the organisation. However, since Alison was involved in training 14 people in-house as conflict coaches the number of cases of workplace conflict has significantly reduced from 35 in 2015/2016 to just 7 in 2017/2018. Michelle commented how the reason for the change is that encouraging people to resolve conflict on an informal level requires employees to take some responsibility for their part in the conflict, which is something that formal processes do not allow. Angela Lewis, Director of People Transformation, Companies House shared the successes of adopting a Neutral assessment approach in four cases within Companies House working in partnership with Resolution at Work. These cases involved interpersonal issues within different departments, low engagement and concerns regarding leadership or management. We are very pleased and proud to announce that Angela and her team were successful at the Wales CIPD awards the following day in winning the Employee Engagement Award for one of these projects! One thing that clearly came out of the Cardiff CMC Conference was that one conflict resolution option will no longer fit all and there are a range of different options out there which can assist in positively resolving conflict before situations become entrenched. What fits one organisation may not be the same elsewhere and each situation may need a different approach. Whatever the approach, what is clear from hearing the speakers at the Conference is that informal conflict resolution will undoubtedly save your organisation time, money and stress. For further information about any of our services or training please see here or contact us at [email protected] 0117 330 5980 (England) or [email protected] 01446 760993 (Wales) to discuss.